Here’s a short one for today. Since I don’t live where it’s cold all I can do is dream about what it’s like when the winter months arrive. I have palm trees and sun all year long, most times I like it but a few times I wish I could experience the snow and cold just for a day or two. When I think of cold, the first thing that comes to mind is staying warm, hence this cup of tea (or whatever warm beverage you prefer.) Enjoy! but that’s a winter dream. It took me ages to settle on one shape and poem for today’s challenge..and yes was it a challenge, good one Ben but I met your challenge and raise you a syncope as well! 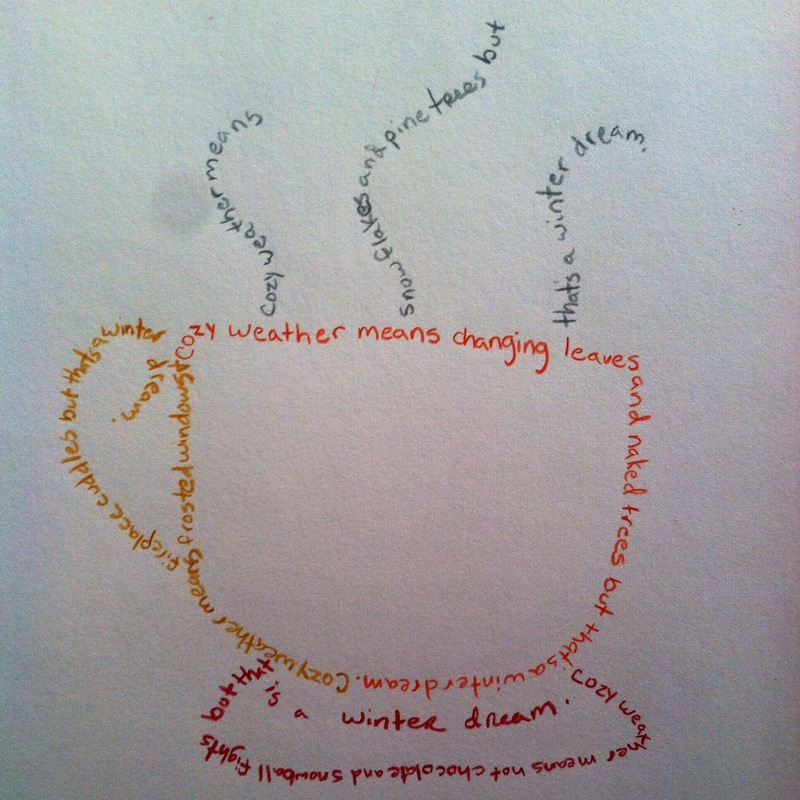 This entry was posted in Art, Poetry and tagged cold weather, concrete poem, poetry, writing 201. Bookmark the permalink. Thank you 🙂 I also love hot drinks in winter, there are just so many varieties. That sounds amazing! I’ve heard of mulled wine and always wanted to try it, maybe this year! Love the word picture and the poem! This is just so sweet, I love it ! Thank you! Yes, funny how thinking of cold makes you think of cozy and being warm! I love the shape you chose! Perfect for your poem! I live where there are four seasons. In the last few years, the colder times have been mild (which is just fine), though there’s nearly always snow in late fall and winter. I taught international students here for a time, and the students from Afica (who had never been up Kilimanjaro) were so overjoyed to see the first snow fall of their lives, they ran outside and danced among the shapes that blew and fell. I shall never appreciate the snow the way my students did. All these thoughts and remembrances were evoked by reading your poem. Reading in the photo is a treat. The way I have to move my head to enjoy the lyrics makes the image seem as if it’s moving, like the way steam rises above a cup filled with a hot drink. The words themselves are thought-provoking. As I read the refrain a number of times, I finally saw two meanings. For those who don’t have winter to live through, the winter activities crafted create overall an image or dream of winter never tried. But the actions and scenes crafted also make one who does have winter see a romanticizing of the season. We could wish winter were always like this, though it has its rough-edged parts as well. This twofold response makes your poem universally appealing. Thank you! Wow you analyzed my simple poem so beautifully and eloquently..yes, I did mean to have a double entendre for “winter dream”. Especially your former thought of winter activities never tried, that was the front runner on my mind since I had never experience snow only once when it was Christmas Eve and it was the first time it had snowed down here in over 100 years! It was a magical experience and I was happy to live through it, even if it was for that one special night. I’m glad my poem made you think and remember, it’s what I wanted to do. I’m happy you enjoyed snow that one time. I don’t consider myself a nostalgic, but your work brought up good memories I was pleased to recall. I deeply appreciate that. Love the symbolism of the cup and steam. Also, great poem.